It was on a sun-drenched sidewalk in a neighborhood on the fringe of downtown Mexico City, lined with mom and pop stores selling everything from new tires to fresh tortillas and dotted with apartments that stood overhead billowing the day’s wash from open windows like colorful patriotic flags, that I tasted my first sopes. I was twelve or thirteen and just on the cusp of exhibiting signs of teenage annoyance, feeling slightly put out by our annual, month-long, summer treks to Mexico City; trips that were always capped by a week’s loll on the beaches of Acapulco. Cue violin. As frustrating as I believe this pubescent mindset must have been to others, I acclimated quickly every time... and remember my aunt’s sopes contributed greatly to that end. Her sopes were made on a large round comal, best described as a big drum-shaped grill cradled on a hefty stand, that was set right in the center of the walkway in front of the storefront she owned along with my uncle; a doll-size space that offered a limited selection of fresh produce, and oft-sought after grocery and household items, to the families that lived in the three-or four block mix of residential and commercial buildings that surrounded it. Though both my aunt and uncle owned the business, the family referred to it as Virginia’s tienda-sita, or Virginia’s little store. Given the popularity of my aunt’s sopes, it is no wonder why she got top billing. Once a week my aunt would drag out her specially made grill and begin the pinching and patting out of literally hundreds of sopes, with lines of neighbors coming from near and far to partake. Within minutes the air would take on a festive quality, with accolades of que sabrosa being chimed all the way down the block, and my aunt happily tending to her handcrafted array of simple little rounds of masa harina, crisped to perfection, with perfectly pinched sides to hold in the simple fillings that topped them. Always at hand was a pot of freshly cooked pinto and/or black beans, succulent bits of cooked chicken, crisp shredded lettuce, a homemade salsa or two, queso fresco, and/or a smooth crema. Nothing fancy in presentation, location, or flair. It was a far cry, to say the least, from the Southern California suburbia I was used to... and I loved it. Looking back, I suppose I loved the simple, genuine, gracious ease my aunt had with people as much as I loved her sopes. Perhaps that is why they were so good, each seasoned with her delightful touch. While there are probably more than just a few schools of thought when it comes to making sopes, I updated what I could recall of my aunt’s delicious offerings. 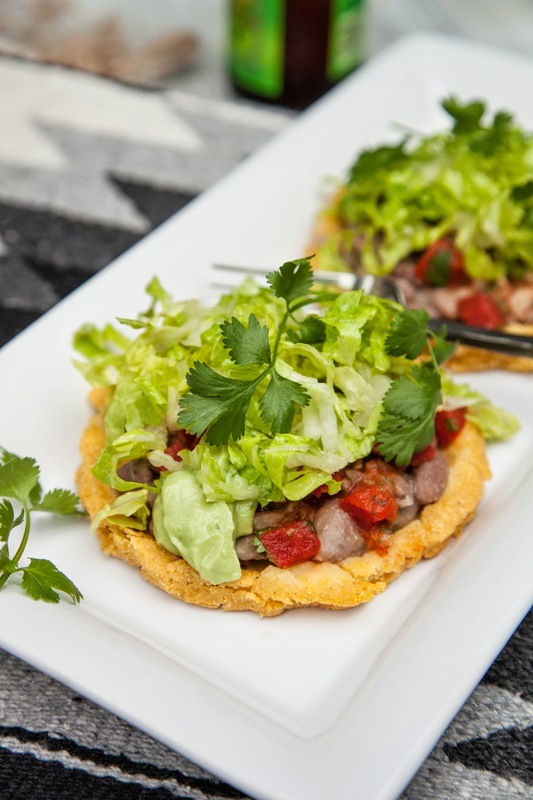 These are gluten free, non-dairy and vegan... with pinto beans, a quick-and-easy salsa, an avocado non-dairy crema, and fresh shredded romaine topping little masa harina saucers (made with Bob’s Red Mill Gluten-Free Masa Harina). Though you can certainly use canned beans, these are made with the real deal (using an easy day-of “soak and cook” method). And, instead of a deep fry, these masa rounds get a quick, light grill in just a hint of coconut oil... then a pinch to form rimmed edges... then a very quick fry in a few tablespoons of additional coconut oil. Though I don’t have a traditional comal, a flat grill or large skillet set over high heat does the trick. A good golden grilling on one side, then flip your disk of masa harina and lightly grill up the other side. Then remove it from the heat and pinch the edges of each “sope,” with the more grilled side up to form a slightly raised rim (careful as they are still warm... it’s as much pushing in and pinching up as much as anything… think Playdoh… using all your fingers, thumbs on the outside pushing in and fingers on the inside of the masa round pulling up and out). Then when ready for the second round of cooking, heat your coconut oil and quick fry each to finish them off, transferring to a paper towel to pull any excess oil out.. Some simple fixings... and they are ready to plate... table-side (or on a sun-drenched walkway) where your only care is wondering when the next batch will arrive. 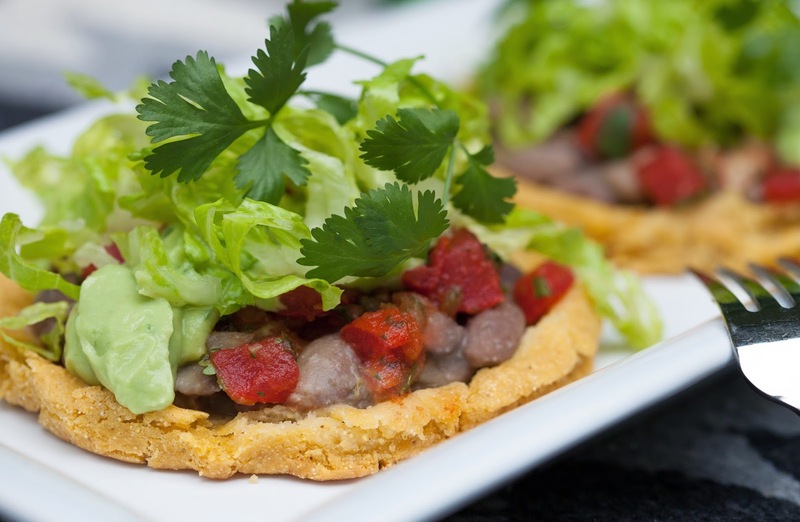 These sopes are made with Bob’s Red Mill Gluten Free Masa Harina and topped with slow-cooked pinto beans, an easy dressed up store-bought salsa, and a non-dairy avocado crema. You'll have plenty of beans left over for making up additional batches of sopes or for working into another dish (like a veggie soup, using a little of your reserved cooking broth). * To prepare dried beans on day-of, simply place prepped, dry beans in a large dutch oven or pot and add water to cover by 5 inches. Season with a tablespoon or two of kosher salt, bring to a boil, then cover, remove from heat and let sit for 1 hour. Then drain beans and return them to dutch oven/pot. Add enough fresh water to cover by a few inches or more (you may need to add additional as they cook) and whatever aromatics that please you (this is when you season them... cilantro, stalks of celery, quartered onion, whole garlic cloves, a little more salt, etc... taste the “broth” as you go and adjust). Bring uncovered pot to a boil and then reduce heat and let simmer on low for approximately 45 minutes to 1 ½ hours (when you taste 5 beans that taste done... you are done!). Drain beans into a colander set into a large bowl... save your “broth” (it’s tasty and can be used to start a soup). Remove and discard cooked aromatics from beans as best you can (no need to be too picky). You can stop here are take a quarter of your beans, add a cup or two of your broth and emulsify this portion in a blender. Then add puréed beans back to cooked beans... to get a bit more of a soupy blend. Begin by prepping your salsa by combining ingredients in a small bowl. Set aside. Then in the pitcher of an electric blender, purée avocado, lime juice, “yogurt,” and salt, until smooth. Transfer thick “crema” to a small bowl, cover with plastic wrap, and place in fridge until ready to serve. Then mix your masa harina, water and salt in a bowl until completely combined and holding together firmly when pressed. Form masa into one large round, quarter and roll each quarter into a ball. Working with one ball of masa at a time, place between sheets of parchment and press into an approximate 5 ½-inch flat round (3/8” thick). Continue with remaining portions to make four rounds, cover with damp paper towels to keep moist. Heat 1 tablespoon coconut oil in a deep skillet over medium high heat. Brown masa rounds (working in twos)... cooking first side for 2 minutes, until golden, then flip and cook other side for approximately 1 minute. Remove from heat, let cool for approximately 1 minute, place longer grilled side up and carefully pinch sides to form a low rim (this side will not receive any further cooking). Repeat with remaining portions. Then add remaining 2 tablespoons coconut oil to skillet, increasing to high heat. Again, working in twos, place masa rounds, flat-side down, in hot oil and fry for approximately 2 to 3 minutes, until golden. Remove to paper towels to drain. Repeat process with remaining masa rounds. To serve, top masa round with a bit of pinto beans, a generous spoonful or two of salsa, a dollop of avocado crema, and a good heap of shredded lettuce. Enjoy.